This weekend I was serving some roasted chicken which called for a bit of zing. Remembering that I had purchased cranberry sauce as one of my I'm-back-in-the-US milestones, I retrieved the can from the cupboard. One small problem. I had no can opener. Here I am in the land of Yes We Can; but No I Couldn't. 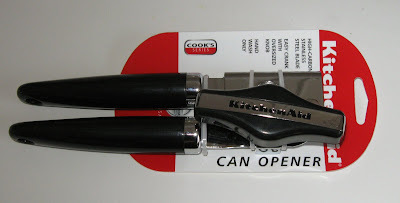 I had made the requisite trips to Target and Bed, Bath and Beyond to properly outfit my batterie de cuisine, but a can opener was completely off my radar screen. When I first moved to Paris and set up housekeeping in my apartment, I acquired all the kitchen utensils I thought I'd need, including a can-opener [ouvre-boite]. That scrawny metal can opener hung forlorn in my utensil holder for the entire three years that I lived in Paris. Never once did I have to crank that knuckle-numbing knob: every can in France that I ever bought -- tuna or soup or marrons glacés -- had a pull-tab to open it. The can-opener, happily, was de trop. Somewhere in the back of my mind I guess I assumed that this simply reflected an advance in canning technology and that now all cans worldwide had the same pull tab (and a much less scary edge when opened). Mais non. What, I ask, could be so difficult about installing pull-tabs on all aluminum and metal cans? Why isn't it a standard practice in the US? Hmm. Maybe in France the catch phrase should be "Yes we can can" and in the US "No we can't can." In my email inbox today was a message from Air France promoting round-trip airfares from New York to Paris hovering at the $420 mark. Even adding in the security taxes and surcharges, it's still about the cheapest transatlantic price I've seen in over three years. Tickets must be booked impulsively, i.e. before February 28. Let's give a cheer for rash decisions! And besides (in case you hadn't noticed my new, lovely blog ads) you can quickly book your tickets by clicking on the thoughtfully furnished Air France link at the top of the right-hand column of this page. This could be the cure for my three-month Paris jones. 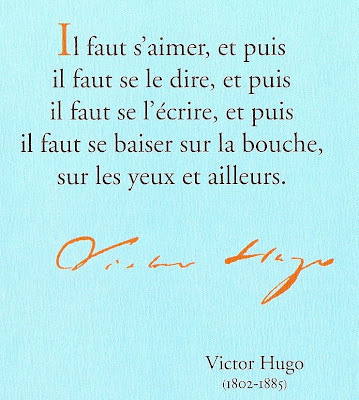 I have to say, romance does sound better in French. In Paris, there is a tendency -- especially for those new to the city -- to decry the proliferation of sidewalk droppings from Parisian pooches. I have to admit that in three years of living in Paris I never -- never! -- stepped in dog poop. Though I saw a bunch of real doozies on the sidewalk and curbs, especially in the morning when they were fresh. Eventually, though, it all becomes second nature. Ah, how things change when one returns to the US. I've just moved to a delightful white farmhouse on a hill in Virginia. So lovely and bucolic. So serene. The most noise is the occasional quite romantic sounding of the train's horn as it passes at the railroad crossing at the bottom of the hill. And in the pasture just across the fence are two horses and two donkeys. Oh, how they add to the lore of the place. They silently roam the field by day, munching the grass. But when nighttime falls, and the horses settle into the barn, the damn donkeys slip through some section of unguarded fence and wander into my yard. When heading up the driveway one evening, through the car's headlights I thought I spotted the world's largest, homeliest deer grazing in my yard. Au contraire. 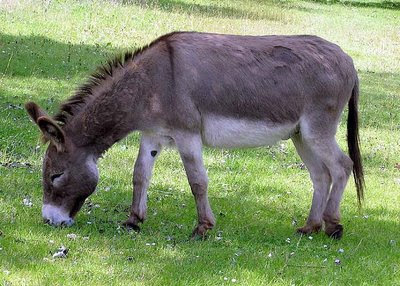 It was Eeyore, and his pal, chowing down on my lawn and leaving his calling card here, there, and everywhere. Don't lose your appetites, folks, but it looks -- at best -- like huge glistening pyramids of brown charcoal briquettes randomly scattered outside. Apparently this has been happening for a while prior to my arrival here, so the donkey doo-doo is a bit overwhelming. And -- well -- all I can say is, in terms of animal droppings, I'd prefer the Parisian sidewalks any day. At least they're cleaned up once a day. So I don't want to hear anyone complaining about les crottes de chiens in Paris.